Davitamon Junior 3+ chewable vitamins raspberry Davitamon Junior 3+ chewable vitamins is a multivitamin with minerals, specifically tailored to the needs of children from 3 years in form of chewable tablets with delicious raspberry flavor. Multivitamins with minerals for children from 3 years. Good for the resistance. For growth and development of bones. For strong teeth. Because growth is not automatic, it is important that children get enough vitamins and minerals. A dietary supplement can help. The balanced formula of Davitamon Junior Chewable Vitamins 3+ is tailored to the specific needs of children from 3 years. 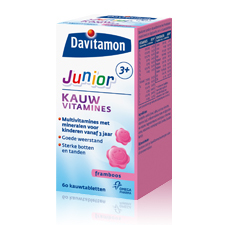 Davitamon Junior 3+ chewable vitamins you also give your child a good addition to the diet.